SuperManager is primarily an order processor / order manager with links to many eCommerce platforms. However, it also offers several features for managing purchasing of your products. The recently released version 1.6.0.0 adds to these features by offering a new feature for re-ordering all products that have passed below a re-ordering threshold. In SuperManager a product can contain product option lists for defining different variations of the same product. For example, you could define a size and/or color option for storing different variations of a product you sell. SuperManager can then figure out all the possible unique combinations of those options there would be and create what it calls a product variant for each of those combinations. SuperManager stores inventory for each product variant. For example, if you sell a T-shirt and have it in red, yellow and blue and large, medium and small, SuperManager could create up to 9 different product variants for that product and track inventory on each one. If you do not have any options on a product, SuperManager still needs to create a variant for storing the inventory and other inventory/purchasing related data. 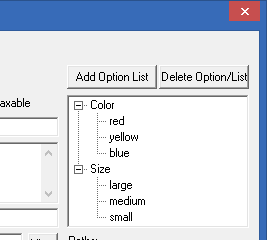 You can press the “Add Option List” button if you need to add a new option list or right click on an existing option list and choose “Add” to add a new option to that list. Existing options can be modified or re-ordered by right clicking on them. Once you have the options defined as you want them, look at the bottom right hand corner of the product details, where the variants are listed. If none exist you can click the “Create All” button for it to automatically generate all possible variants. You can click “Add…” to add one of the variants not yet created or add the default variant if you want just one variant for the product. Once you have created variants, you may need to adjust some of the data for the variants. Two important things related to purchasing are the supplier and the re-order at setting. If you don’t currently have any suppliers defined, you will first have to create suppliers. 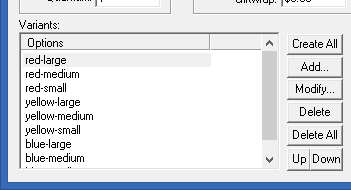 This is found under “View”, “Suppliers” from the main menu in SuperManager. After creating the necessary supplier, you can come back to the product details, select the variant from the list on the bottom left and choose the supplier from the drop-down on the bottom right. If your supplier calls the part by a different number/code than you do, you will need to input the appropriate supplier part number in the box below the supplier. Then set the re-order at limit. This is an inventory quantity that SuperManager will use as the threshold below which it thinks you will want to re-order more. We’ll get to that part later. You can also specify an optimal quantity on hand. When SuperManager re-orders this variant it will order enough to get you back to this level. Note that many of these features can be done in batch. You can select more than one variant from the list on the left and define the supplier, part number and other values for all of them at once. You can also create variants and do some editing of product variants on the product list. Choose the product(s) you want to work with on the product list, go to “Actions”, “Variants” from the main menu to create or delete variants. Once you have created variants for the products, you can have SuperManager start tracking inventory for them. First, you need to turn on inventory tracking. This is done under “View”, “Store Settings” on the “Order Processing Automation” tab. Check the “Track Inventory” button at the bottom left of that property page. After inventory is defined, SuperManager will start to decrement inventory values as orders are imported from your web stores or created within SuperManager. When you create purchase orders, SuperManager tracks the amount of a product variant you have on order. When you mark POs as received, it adds to your inventory. SuperManager stores your inventory in lots. This allows you to track how product makes its way into your inventory as well as first in, first out costing. You can look at these lots by going back to the product details screen and double clicking on the variant you want to see. If necessary, you can go here to modify adjustments, add new adjustments, update amounts remaining in stock from a particular inventory lot or change the cost of products in a particular lot. You can manually create POs to a given supplier. To do this, just go to “View”, “Purchase Orders” and press the “New PO” button. When you save a new PO, SuperManager will create inventory lots for each purchased product and mark them as “On Order”. When you receive all or part of the order, you can right click on the PO on the main PO list and choose “Mark Items Received”. SuperManager will then allow you to receive the entire PO or specify which parts have been received. Received products will be changed from on order to purchased and the inventory will be available for use. When new orders come in and one or more of the items ordered are not available in inventory, SuperManager will automatically set the order statuses to backordered. 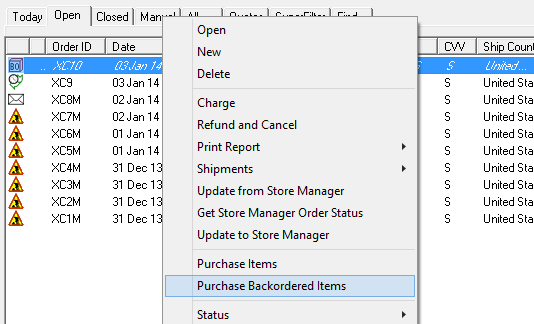 You can select all backordered orders, right click and choose “Purchase Backordered Items”. This will create a PO to each supplier required to order all backordered items. The items and the orders will then be changed to on order status and will be linked to the POs so that when the POs are received, they will be set back to open status. You can go to “View”, “Products” and select products you want to re-order, or select all products, right click and choose “Purchase Re-order products”. This will create POs to purchase products that are below the re-order at level and bring them back to the optimal inventory. We hope that these features will enable you to efficiently deal with purchasing and inventory control. We love feedback! Please let us know how SuperManager can better meet your needs!